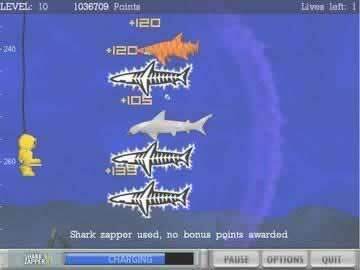 Typer Shark Deluxe Game Review - Download and Play Free Version! Learn to be an excellent typer and have a great time doing it! Fantastic learning tool for kids and adults! Different game modes keep the game interesting. Various sharks add to the difficulty. Game's difficulty is adjusted to your typing abilities. Doesn't offer instructional help for typing (hand positions, home row, etc..). Everyone needs to learn typing in this age of computers. Poor typing skills wastes time, creates frustration, and costs some people job opportunities. Typer Shark is an excellent game for anyone who wants to improve their typing skills. The fun games involved will keep people motivated to keep learning and improve their skills, rather than going through boring drills and becoming frustrated at the lack of progress. Typer Shark will not leave you frustrated but instead works with your typing skills. Find out your starting words per minute in the tutorial and then start at a game level that suits your current skill. Have fun defeating piranhas, sharks, and other sea creatures as you type the letters or words on their bodies. Typer Shark includes a few different types of game play to keep the fun level high. You can explore the deep seas in Adventure Mode and mine lost shipwrecks for valuable gems. In Abyss Mode, see how deep you can go as the fish get harder and harder to defeat. All your stats are kept track for you to monitor improvement. This game is great for any age level and especially good for classroom use. Despite its educational purpose, Typer Shark is a really fun game that increases your typing skills. In this game you are a diver who has to fend off killer sharks by zapping them with your electric “Shark Zapper.” To activate the zapper you must spell the words that appear on the sharks' bodies. If you fail to spell the words you are eaten and the game is over. Be wary of the different types of sharks that might require you to spell multiple words or type at a faster pace. There are three options of play in this educational typing game. These modes are accessed after you complete a typing assessment, which adjusts the difficulty of the game. Slower typers have less ability, thus the game is adjusted to fit their needs. Words are not as difficult in the different modes and the sharks come at a slower rate. The first option of play is the challenge mode that will have you diving to roughly 280 feet. As you dive you are faced with sharks that vary in difficulty. The deeper you get and the further you get in the game determines the difficulty of the sharks you face. The first sharks might only require you to spell one small word, while the later sharks like the hammerhead, require you to spell two words before they are zapped. Piranhas as well as tiger sharks, ghost sharks, and toxic sharks are all featured in this game. The second game mode, Deep Abyss, is similar to the first except rather than diving to 280 feet you dive until you are eaten. The difficulties of the sharks change the deeper you go. As far as gameplay is concerned, there are no huge differences in this mode of play. The third mode of play, which does offer differences, is a typing tutor. 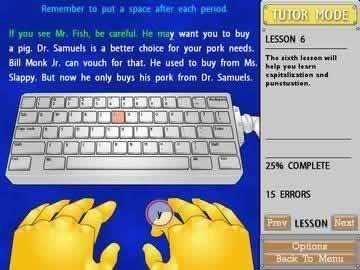 This tutor tries to perfect your typing abilities by improving upon your accuracy and speed. In this mode you go through different exercises that help build your typing abilities. You might type a repetition of the home row or alternate between two letters. These exercises are designed to improve the muscle memory associated with typing. The only drawback to this mode is the amount of instruction. Rather than teach the essentials of typing right away (home row and hand placement) you perform exercises without a lot of explanation. If the teaching element were stronger in this mode it would be a great improvement, making this game much more helpful. Overall, Typer Shark is as great of an educational typing game as you will find. You might forget that you are actively learning because you are constantly wanting to fend off the sharks and improve upon your last score. This game is for anyone one wanting to improve their typing skills. The adjustable difficulties help everyone, regardless of how advanced you are now, to improve. This would be a perfect addition to a family computer because it is educational and would improve the typing skills of not only the kids, but also mom and dad as well. Player created video showing the first few levels. No sound.